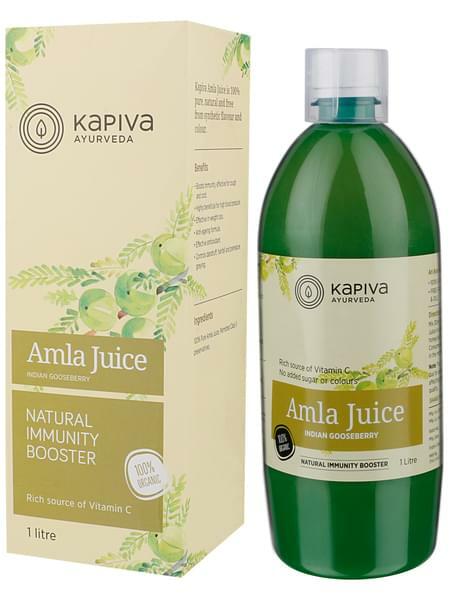 • Treat your body to the goodness of Kapiva’s Amla Juice and enjoy the benefits of all the vitamin c, iron and calcium that it supplies. • Provides effective control over common cold and cough. • Helps regulate blood pressure, ensuring it stays within a healthy range. • Anti-ageing properties give the skin a healthy and supple glow. • Aids weight loss by providing a metabolism boost. • Reduces hair fall and fights against early grey hair. • Minimises cell damage due to its numerous free radicals. • Minimises the risk of heart disease by curbing the build-up of bad cholesterol. • A daily 30ml shot of juice will keep you in good health; add 30-50ml of water for flavouring. • Kapiva derives its name from the three doshas of ayurveda – Kapha-Pitta-Vatta. our range of 200+ GMP Certified products have the right herbs in the right dosage and provide solutions to a variety of ailments. It's the day and age of hybrids, so go ahead and enjoy the best of both worlds - Ayurvedic tradition + Modern-day science and technology.